Sometimes a few crazy people can make an entire group look bad. Maybe that is what has happened with Ron Paul supporters. We see some crazy Ron Paul people on the news and we paint the entire group as being crazy. It is like these bad cops who think they are above the law and they break the law and do things like and beat people up on video. That is why some people hate cops when, in fact, most cops are doing a great job and risking their lives for us. The problem is that the few bad cops you see on TV unfairly make all cops look bad. I am friends with many Ron Paul supports but I am not part of any Ron Paul groups so I did not know what to expect. I had seen internet articles telling people to watch out for Ron Paul people trying to take over conventions so I was interested to see what would happen. The group that I got to meet did not have signs to stage a protest and they did not walk around asking people to legalize marijuana. In fact, you probably would have never known that they were even Ron Paul supporters. They came off as just very passionate conservatives. You might have known them for years and you might have thought they were probably just members of the tea party. There are many young people in the Ron Paul groups but there are also a surprising number of older people and minorities too. They are a very diverse group. I had great conversations with a Ron Paul group about the Federal Reserve and how printing more money with nothing to back it is destroying our economy by devaluating the dollar and not allowing the market to fix itself. Being in the military myself, I don’t entirely agree with some of Ron Paul’s war policy, but I had a great conversation about war policies and there are actually many things that I do agree with Ron Paul on. The President must not be allowed to start a war without getting congress to approve it. There are checks and balances that must be followed. We are sending money to help terrorist countries. It is especially frustrating now that President Obama is using the military as pawns and taking out bad governments, like Egypt, just to hand the government over to the Muslim Brotherhood. One gentleman that I talked to has run Christian charities and one of the reasons he stands with Ron Paul is because the government is slowly taking away our religious liberty. As the head of a Christian charity, he saw firsthand how the rights of Christians to freely practice and express their religious beliefs were being taken away. As a Christian, I know that he is right and this must be stopped. These people were not crazy. In fact, I agreed with most of what these Ron Paul supporters believe, as most conservatives probably do. No, I don’t agree with everything and I have no problem expressing where I do not agree. No one agrees with each other 100% of the time, but the many issues that I do agree with Ron Paul on, Ron Paul is 100% dead on right. 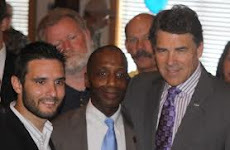 I even got a chance to explain to these Ron Paul supporters why I was not in favor of Texas being proportional. Earlier this year, the RNC forced Texas to be proportional. Texas had always been winner take all by congressional district. This is what the Republican in Texas voted to have because it gives Texas more of a say in the Presidential race and makes us more relevant (we have been completely irrelevant in recent Republican Presidential races unfortunately because the race is over before we even vote!) Well, the RNC comes along and tells us we have to be proportional. I stood up the RNC and told them that they should not bully us and advocated that we stay winner take all by congressional district, which is what we already were before the Republican National Committee forced us to change. I was standing for Texas and what the grassroots in Texas wanted. I was standing for Texas to have a bigger voice instead of being pushed around. Well, I had some Ron Paul supporters upset with me because they thought that the reason I did not want to be proportional was so that I could keep Ron Paul from getting delegates under a proportional system. That is NOT the reason I did not want to be proportional. Hurting or helping Ron Paul was not even a factor in why I was saying NO to the RNC’s proportional system. In fact, I was able to explain that if Texas had gone back to winner take all by congressional district back when there were still four candidates in the race, it was very likely that Romney would not have won Texas and would not have received many of our delegates. This would possibly have forced a brokered convention which would have actually benefited the Ron Paul supporters. So we had a good conversation about that little misunderstanding and cleared some things up. Did these Ron Paul supporters try to get fellow Ron Paul supporters elected as national delegates? Sure they did. But who didn’t? The establishment passed out papers telling their people to vote for their establishment candidates. Just about every county Republican group nominated a candidate from their county who they know and are friends with. You had entire counties voting for the candidate from their county vs. candidates from other counties. Every group at the convention tried to put up a candidate to try to be elected to something, so why can’t the Ron Paul supporters do that to? They have every right to put up someone from their group to run. The Ron Paul supporters I got a chance to meet this past weekend were respectful of the process and did not try to take over anything. They nominated fellow Ron Paul supporters and these nominees then got to stand in front of the entire group of Republicans and explain what they believe and explain why people should vote for them. Some of the Ron Paul supporters got elected by the group and some didn’t. These Ron Paul supporters are not stupid either. From what I got to hear from them, they understand that Romney probably already has the nomination. They understand that the chance of a brokered convention is slim to none unless there is a change of the current rules of how presidential delegates can vote. They understand all that and they are not unrealistic. They were more focused on getting people involved in the process who will go to the national convention and stand for less government and stand for the constitution. They know that, even though they might not prevail, you cannot give up and you still have to speak up and let your beliefs be heard. There is no chance of America ever going back to follow the Constitution if everyone just accepts that the Constitution is gone and stops speaking up about it. They are simply not giving up. Whether you agree with Ron Paul supporters or not, the Republican Party is going to need all hands on deck if we are going to defeat Obama. We will especially need Ron Paul supporters. Obama has the upper hand when it comes to young votes. Ron Paul groups are filled with young voters. Ron Paul groups are also filled with a ton of passion and dedication. By casting out these groups, not only are we losing those young voters, but we are also losing out on the passion and dedication they bring to the table. The Republican Party must embrace Ron Paul Supporters. It was said to me this weekend that, maybe the reason some of the Ron Paul supporters act a little bit crazy is due to the fact that acting crazy is the only way they can be heard. They don’t act crazy because they are crazy. They act crazy as a way to be heard because they have been rejected from the Republican Party and are having to fend for themselves and have to create their own unconventional platforms to speak from to get their message out. Maybe if Ron Paul supporters were embraced by the Republican Party, we could all sit down together and have a conversation about how we can work together to promote the things that we agree on, like more states rights, less federal government, following the constitution, etc. We can work together to defeat Obama. The establishment in Republican Party might not agree on everything that Ron Paul supporters believe, but there is probably agreement on at least 80% of the issues. The Republican Party could greatly benefit from Ron Paul supports in order to accomplish the many things that both sides agree on. WE especially need Ron Paul supports is we are going to defeat Obama. After this weekend, I have a new respect for and understanding of Ron Paul supporters and I fully believe that the Republican Party should embrace them and work with them instead of trying to ignore them. We need them. We might not all agree 100% on everything, but overall, Ron Paul is GOOD for the conservative cause and his supporters can help the Republican Party and help defeat Obama. I am sure my little brother in high school will love me for writing this article. He is a big Ron Paul fan. I am not sure how he became one or how he even got to know anything about Ron Paul, but it happened. It is happening with youth all across America. It is something that we cannot ignore and we could greatly benefit from if we embrace the youth, passion and of these Ron Paul supporters. Well it looks like some1 finally took notice and understands. But sad to say its to late. Ron Paul supporters are the most consistent of any people and will not compromise on their moral beliefs. Many of them also rightly see romney as a republican bagged obama. Everybody wants obama out (except for the extremely dimwitted) but the fact of the matter is, it doesn't help when you make your entire platform to be able to defeat obama, and then make your nominee just like him. The establishment is scared of Ron Paul because he would obey the Constitution, which give them nothing to 'sell' to their donors and would expose the farce that has become our federal government. Hey, I just wanted to let you know I appreciate your fair article and defense of Ron Paul supporters. :) I'm one of the more "extreme" libertarians that would probably grate on you more than others (though extreme may be a misnomer: http://www.fff.org/freedom/0890b.asp), but it's deeply refreshing to see someone on the outside show us so much respect and courtesy. There's been so much slander and character assassination going around about both Ron Paul and his supporters (we're a motley crew) for years, and I think a lot of people who dislike or misunderstand our views have a tendency to want to believe the worst and do whatever it takes to alienate or grief us. A lot of more mainstream conservatives in the GOP base have been increasingly receptive and friendly, but the atmosphere is emotionally charged, and GOP leaders and conservative pundits remain among the worst offenders. In this kind of climate and with all the recent altercations at conventions, it takes uncommon character for someone like yourself to write such a supportive article and risk taking heat for it from others in your own camp. Many of us used to be misguided liberals, and many of us used to be more mainstream conservatives unwittingly following neoconservative thought, but most of us are so far removed from our old viewpoints that it's not always easy to gauge where most actual conservatives outside the DC Beltway and media world really stand relative to us. For some of us, the pundits and narcissistic party leaders are the only barometers we have for typical Republican sentiment and worldviews, but they obviously give a pessimistic reading. ;) If more conservatives continue to adopt your cordial and thoughtful attitude toward our disagreements, then maybe we'll all manage to save this country from collapse and tyranny after all. Thank you, Mr. Bellow. I can assure you that it has been as difficult to get many of the Ron Paul supporters to see mainstream Republicans and even Tea Party Republicans as valuable allies who believe in much of what we do as it has been to get people such as yourself to see Ron Paul Republicans the same way. Part of the problem was that some of our old leadership at the state level played a game of divide and conquer by emphasizing the difference between the different groups within the party instead of bringing the party together to work for common goals. I believe the new leadership provided by Steve Munisteri to be a big part of what's changed. Surely, he has his own rather passionate beliefs, yet notice how deftly he supports all the different factions within the party without showing partiality to any of them. There are many areas in which we agree and can work together; I look forward to working with you on those issues in the future. It is truly unfortunate that the GOP has played so unfairly with Ron Paul, it was a wake up call for me, that the GOP does not really support the conservative principals that I support, as a lifelong republican I can`t tell you what a disapointment they have been, while I find some sollice in your article, the damage has been done, I will be supporting the constitutional or libretarian party hereafter. Good luck with your candidate in the general election. Great article, sir. I am encouraged by this sentiment and applaud you for it. I am a firm believer in forming coalitions with like minded folks and finding the common ground we can all agree on without sacrificing our principles. It is unfortunate that we are painted with a wide brush, but as you stated, the movement has a wide cross section of races, ages, and professions. We represented ourselves well and the discussion was civil and fair from my perspective. A lot was accomplished this past weekend to promote freedom and liberty for all. One thing that people need to understand is that the primary reason the Texas Convention went the way it did, as opposed to the way the Louisiana or Oklahoma convention went, is Steve Munisteri. Mr. Munisteri, the Chairman of the Republican Party of Texas went out of his way to ensure that the Texas Convention was run fairly and that the rules were followed. I have a very good friend that was a delegate to the Louisiana Convention. In Louisiana, some of the Party regulars that were in a position of authority at the convention, tried to silence a group of delegates that made up well over 1/2 of the total number of delegates to the convention (maybe as high as 2/3 of the total). They did it by completely ignoring State Law, Party Rules and generally accepted rule of Parliamentary Procedure. Liberty supporters, as I like to call Ron Paul supporters, are like any other group (Conservatives, Liberals, Tea Party, Environmentalist, etc.). A small percentage of them tend to be disruptive, no matter what. The vast majority of them are not, as long as the rules are followed. The big difference is that Liberty supports tend to know the rules and tend to be a bit sticky about the rules being followed. A wonderful and truthful exchange! My view: If more 'non-Ron Paul' Republicans were as fair minded and above board as David Bellow is, we'd not only remove Obama from the White House in a landslide, but we'd take back America from the shadow "establishment" that owns both parties, Washington, the Federal Reserve, and the IRS. Yes but,I'll vote for no one but Ron Paul! Kudos to Mr. Bellow! I, for a while, did not "see" Ron Paul, because of the smokescreen and emphasis on the "crazies" in the Ron Paul camp in the MSM. But, in Jan, watching results of primaries, it really was obvious they were ignoring Dr.Paul. I thought, hey, he's come in close to winning, why ignore him? Who is this Ron Paul guy, anyway? Well, after researching him online, I found out! Now an "official" Paulbot! Other Paulistas I've met have been normal enough...respect & kindness are not always easy to show, but they will get you farther than the opposite. Just as in race and other differences that divide people, generally, if you look at people as individuals, instead of pre-judging them, and treat them respectfully, you will be surprised at how much you can agree on. If the tea partiers and Ron Paul supporters can come together and run the neoconservatives out of the party, the Republicans will be a solidly limited government party moving forward in the future. This is what I hope happens. Only a few people were walking around with Ron Paul stickers but most were libertarians dressed in Republican's clothing, walking the walk and talking the talk until they won their National delegate seats. They were subversive and scurried into groups around the Caucus to compare notes and identify each other in order to push through their delegates. It's too bad that Ron Paul couldn't direct his mob to funnel their energy into something that will actually help the Republican Party and the nation such as uniting to kick Obama out of the White House. I appreciate the write-up and kind words David. I just wanted to point out that you might actually agree with Paul supporters on military/war policy more than you know. There's a popular misconception in the republican party that we're all pacifists and naive concerning foreign policy abroad. This couldn't be further than the truth. Many Paul supporters have delved into foreign policy and researched the matter as closely as they have the Federal Reserve. We've come to the conclusion that our foreign policy is deeply flawed. I understand your passion for wanting to keep America safe, I think we all share that sentiment, but we must understand history and origin of this conflict. I suggest you look into Michael Scheuer and read his writings on the subject, he is the former Chief of the CIA bin Laden unit, he was in charge of understanding, tracking, and killing the enemy better than anyone. For his part, Ron Paul was only reiterating exactly what comes from the CIA intelligence and what CIA veteran Michael Scheuer writes and speaks about. CIA counter-terrorism expert Michael Scheuer would likely have been Ron Paul's choice for Secretary of State. Watch the video and ask yourself if you'd rather have Michael Scheuer or Hillary Clinton at the helm. I for one would feel much safer with Scheuer. REALLY???????????? WOULD SOMEONE INFORM THE "PAUL" CAMPAIGN HE HASN'T AND HAS NEVER WON A PRIMARY. SINCE HE CANT WIN ON THE GOP TICKET,WHATS NEXT STEP "INDEPENDENT"? TICKET. RON PAUL NEEDS TO GET IT... HE DOESN'T WIN. A VOTE FOR "PAUL" IS A VOTE FOR OBAMA. ITS NOT THAT HARD TO FIGURE OUT. HE IS NO DIFFERENT THAN ROSS PEROT. AND YES THE "PAUL" PEOPLE WERE HATEFUL, MEAN, AND RUDE @ THE CONVENTION. SAW IT, HEARD IT,WITNESSED IT YOU ARE LIKE SPOILED BRATS WHEN YOU DON'T GET YOUR WAY. Or maybe you neocons are the spoiled brats when you have to completely change the rules in the middle of the damn convention because you don't get your way. Learn to think before post ignorance on the internet. Plus ron paul has won a primary and several caucuses. Over 5 states he has one a majority in giving him a spot on the RNC ballot and over 200 bound delegates. He already has several hundred unbound and alternate delegates. When it is all said and done he will have over 20% of the delegates. So please if you would go back to your idiot box and soak up some more bs. Isn't a vote for Romney kind of a vote for Obama? If he gets elected let's see how conservative he really is. Thank you for the considerate post. I find it interesting that the GOP isn't more behind Dr. Paul. His positions are constitutional and hold with the vision of our Founding Fathers. Unfortunately, decades of indoctrination and propaganda have led Americans to the loss of their own liberty. Apparently, it is too much trouble for people to learn about our founding or to read Dr. Paul's books. Doing so would do a lot to correct the misconceptions and media spin. The really funny thing about Ron Paul supporters? They turned off their TV's and picked up books. Because Paul will never be President, his supporters must now form new alliances. Those alliances can never be with the "establishment"...we now have one party with two heads, both going in the same direction. Dr. Paul has created a movement. This movement seeks to restore America to a land of free people where government is chained by the constitution again. I, for one, don't see anything wrong with that.